Just had a quick look at CAP records, starting 1942, and this Dec-Jan is the wettest on record with 1572.2mm. The next closest was only 20mm lower in 1981 with 1552.2mm. The next closest was 1979 with 1384.6 so nearly 200mm lower. I was not even born the last time this happened in Dec and January. Jesus ya bloody spring chicken haha. My previous best is the first of my records. 08-09 with 1035.2mm. That Jan I had 895.6mm, however Dec was only 139.6mm. Dec is far less consistent in terms of rainfall. Same years here too Ron. 2008-2009. Dec '08 = 244.3mm and Jan '09 = 973.7mm. Total 1218.0mm. about 35mm in the last hour, though it may have been more, really smashed down for a while. This event has been unreal to say the least; so much rain incoming and next week looks like it "may" be our turn for the convergence zone according to GFS. Rain really smashing down here! When is Cairns going to be in the warning? Thought BOM would've brought the update forward considering how wild it is around Cairns right now. 85mm since 4pm, smashing it down. 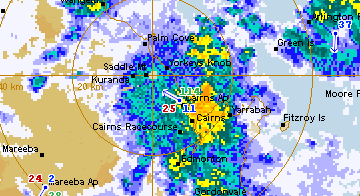 100mm even in the gauge since 9am; rain just smashed down across Cairns. Max Rain rate 192mm/hr here. Look out Townsville... incoming heavies! Could be looking at the totals. Would be awesome if we did get a repeat. As they say in that BoM video, this is a historic event. Whats crazy also is the mention of 1-2m more rainfall in the region ontop of what has fallen. Going by model forecast this is just going to keep going. Great rain this evening, currently on 38mm. Tinaroo might spill tomorrow!! Was wondering the same earlier. Thought I would share this with you guys. Clearly shows how saturated the ground is here. 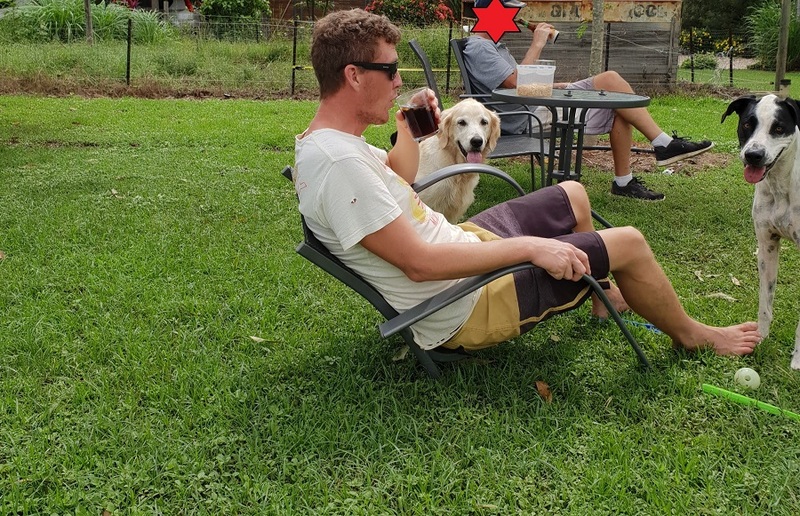 Just sat down to have a drink and throw the ball for the girls and sunk right down to the seat. Think I might still have a few xmas kilos to lose. 46 mm in 40 mins. 01:10 to 01:50. Anyone remember the BOM predicting all this in their recent outlook ??? Yep, right under that juicy cell. I just tipped out a 130mm at 0250am as I head out to the airport. Look forward to seeing my totals on my return from Canada. You got someone to empty your nylex so it doesn't overflow at 250mm ?? Have a polar vortex of a time HF! Hahaha RF, its a quagmire. Pretty sure they have been saying average rainfall for us for a few outlooks now. BoM definitely were not predicting this amazing wet we have had. Their last one had Townsville for below average for feb-april. They will probably get their total for all 3 months by the end of the weekend. 8 registered (DDstorm, mysteriousbrad, Farra, Dr Philosophy, gleno71, Rhys., 2 invisible), 61 Guests and 3 Spiders online.